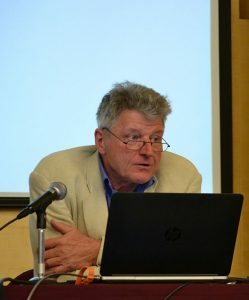 Christian Fleck, Associate Professor at the Department for Sociology, University of Graz, Austria and Chief Research Fellow at the Poletayev Institute for Theoretical and Historical Studies, Higher School of Economics, Moskwa, Russia. He was president of the Austrian Sociological Association and ISA’s Research Committee History of Sociology. Research and teaching posts abroad: Schumpeter Fellow at Harvard University, Fellow at the Dorothy and Lewis B. Cullman Center for Scholars and Writers, The New York Public Library; Fulbright Visiting Professor University of Minnesota, Minneapolis, Directeur d’études invite at the Ecole des Hautes Etudes en Sciences Sociales, Paris; Austrian Marshall Plan Foundation Fellow University of California, Berkeley. Most recent publications: Shaping Human Science Disciplines (Palgrave Macmillan 2018); Sociology in Austria (Palgrave Macmillan 2016); Etablierung in der Fremde (Campus 2015).